Image via WikipediaI love apples. They make great snacks. They're good with popcorn, good with peanut butter, really good with this apple dip recipe I tried recently. They're also good in pies, crisps, cakes, and muffins. The problem I have is remembering which apples are good for what - which ones are for eating, which ones for baking and cooking. So, when I found a list in the food section of my newspaper describing apple varieties and what they're good for, I saved it. Gala apples are small to medium in size with a yellow-pinkish skin. Sweet and juicy, they are good for salads and cooking. Paula Red apples are medium-sized and are red over green skin. Juicy and sweet, they are great for both cooking and eating. Fuji apples are large, with a reddish-pink skin. They are sweet and best for eating and salads. McIntosh apples are small to medium in size with a bright red skin. Mild, they are good for cooking, eating, and sauces. Honeycrisp apples are larger, with a red and green skin. They are juicy, sweet and crisp. Great for eating. Golden Supreme apples are medium-sized and sweet. They are good for eating, salads and sauces. Ginger Gold apples are medium to large with a yellow skin. Juicy and sweet, they are good for eating and baking. I'm not sure if that helps or not. I'll probably still buy my apples the way I usually do - by smelling them and buying the ones that smell the best. I do know that I like tart apples like Granny Smith with that Apple Dip! What? You want the Apple Dip recipe? All right, here you go. I went looking for an apple dip recipe online - there are lots - and combined a couple that sounded good. Mix all ingredients together, then stir in some Heath bits o brickle (baking bits). I didn't measure them, just poured some in. Serve with sliced apples. Tart apples are best. This stuff was really popular! It can be made without them, but the toffee bits really add something. Somebody asked if it was peanut brittle in there, so next time I make this I am trying peanut brittle. It sounds like it will be good. I don't know what it is about this stuff, but I love it! I could eat it all week, and usually I do - because usually I make it just for me. (my husband tends to turn his nose up at things that don't include meat) The flavors and textures just seem to go together so well. 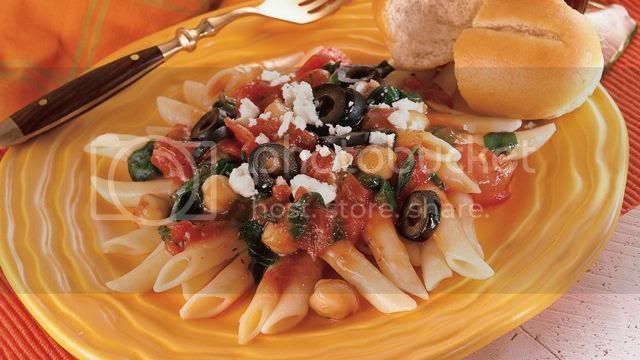 And really, with the beans and pasta and greens, and feta!, who really needs meat? While pasta is cooking, heat oil in large skillet over medium-high heat until hot. Add garlic; cook and stir 30 seconds. Add chard; cook until chard wilts, stirring frequently. Add tomatoes, beans, Italian seasoning and sugar; mix well. Bring to a boil. Reduce heat; simmer 10 minutes. 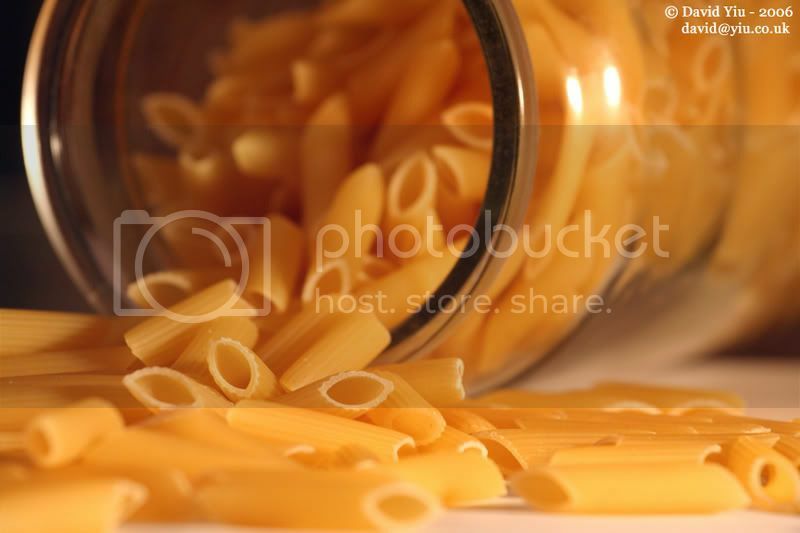 To serve, arrange cooked penne on large serving platter. Top with tomato mixture. Sprinkle with cheese and olives. The original recipe calls for garbanzo beans and spinach, but I've always used the kidney beans and chard, mostly because I like kidney beans better, and I always have plenty of chard from my garden. Also, this is why I need to start saving all my recipes in the same place. I want to make this for lunch, knew I had the recipe printed out somewhere - but I couldn't find it anywhere. So I went looking online and thankfully found it! Some people will lead you to believe that eating the right foods will cost you an arm and a leg. Others may think that the right foods are bland and tasteless. Would you believe that you can make cheap healthy meals in the comfort of your own home? That’s right! Using ingredients from your local grocer, you can make a huge difference whether it is your goal to lose weight, reverse a medical condition, or simply start living a healthier lifestyle. You can do this by writing down some of your favorite meals and looking into how they are prepared. If your favorite dishes are prepared by another person, include these as well. Many of us love foods that are cooked in oil. Though lard is relatively inexpensive, it is the most fattening of the cooking oils available on the market. Some restaurants use lard in the preparation of their meals, but you can go online and look up ways to cook the same foods using canola oil. Though some grocers price canola oil slightly higher than corn or vegetable oil, your best bet would be to buy the largest size possible at a grocery warehouse or discount store. You can also look into ways to reduce the amount of oil used. Dishes like fried chicken can be prepared using less than half the amount of oil that would be used if It were cooked in a deep fryer. Also, look into using oil sprays to make things like french fries and sautéing vegetables. Some of us work long hours and want to have the quickest meal possible. There is nothing wrong with wanting a quick meal, but taking shortcuts can result in taking in extra calories -- fat and sodium. This is especially the case with processed meats and meal starters. If you like to make beef stroganoff, try using a low-sodium or reduced fat cream of mushroom soup along with a teaspoon of your favorite seasonings. If your dish needs more flavor, then add more of the abovementioned ngredients carefully. Dried and fresh herbs are a great alternative for those who are trying to cut back on sodium. Also, roasted garlic cloves can be made easily in your own oven. After spraying the cloves with oil, place them in the oven at 400 degrees for about 20 minutes. If garlic cloves cook uncovered without oil, they will most likely scorch and have a bitter aftertaste, which will make them inedible. Garlic cloves are also good for lowering high blood pressure. Many of us take pride in eating a large meal and when done in moderation, there is nothing wrong with this. However, constant consumption of large servings can expand the stomach, which lead to more an increase in daily calories. Ways to watch our portions is to chew food slowly before taking another bite and to fill up on vegetables instead of breads and other starches. Weight Watchers suggests placing your eating utensil down on the table between bites. This is a natural way to tell your brain that you arefull and will not need more food. Practicing this on a daily basis will lead to less food intake per meal, which will give you more leftovers for later! 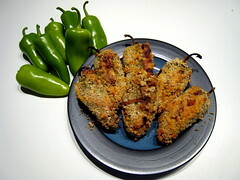 Image by fritish via FlickrSince I have all these hot peppers, I went searching for a recipe for jalapeno poppers and found this post about baked jalapeno poppers - which linked to this recipe - Baked Jalapeno Poppers. Perfect! I didn't want anything deep fried - mostly because it makes a mess, but also because too much grease makes me feel sick. In a bowl, cream together the cream cheese, Monterey Jack cheese, cumin, and cayenne. 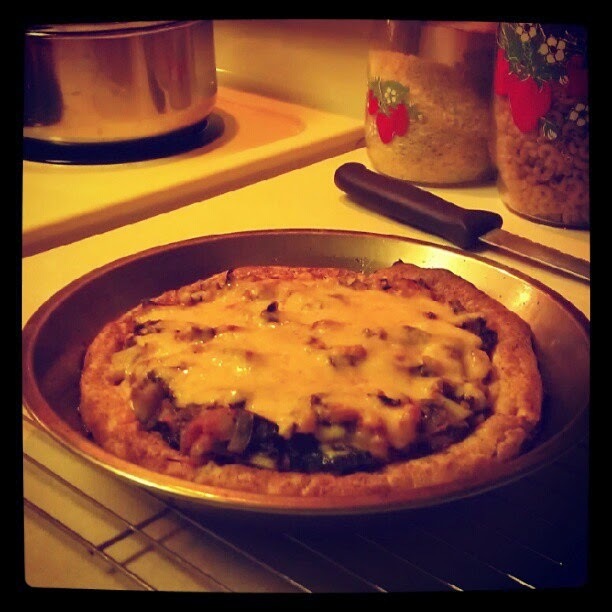 Spread cheese mixture into the middle of each jalapeno half. One at a time, dredge in the flour, dip into the egg mixture, then dredge in the bread crumbs, pressing to coat. If necessary, repeat the process. Place the coated peppers, cut side up, on lightly greased a baking sheet and bake at 350° F until the filling is runny and the crust is golden, about 30 minutes. I didn't follow the original recipe exactly - partly because I wrote it down wrong and partly because it called for 1 T of the cream cheese filling in each jalapeno half, but that seemed like too much - so I just gave up any pretense of measuring after the first half and simply filled them. I stopped counting how many peppers I used, but it was definitely more than 12. I had to add more bread crumbs because I ran out before I ran out of cream cheese mixture or anything else. About the time I finished dredging all the peppers in flour, egg mixture, and bread crumbs, I decided to try egg mixture, flour, egg mixture again, bread crumbs - and that seemed to work better. Just remember the cardinal rule - wet with one hand, dry with the other - or you'll end up with a huge mess. It's messy enough as it is. I did not bake all of these - just a few because I just had to try them. I put them all on a wax paper-covered cookie sheet and placed them in the freezer. Once they're frozen, I will place them in a sealed container, probably with wax paper between layers - all ready to take out and bake whenever I get the urge. The few that I did bake and try? Amazing! Seriously. These are so good. Yes, they take quite a bit of time to prepare, but I'm thinking they're worth it. To Freeze Peppers: Halve sweet peppers (green, red, yellow or purple), remove the core and seeds, and slice into julienne strips or small 1/4" chunks. Pack them into a freezer bag, squeeze out the air and throw them in the freezer. That's it! Frozen peppers are best used in a dish that gets sauteed, such as a stir-fry, or added to onions and potatoes for a tasty omelet. To Pickle Peppers: Prepare peppers as above. Fill a clean pint or quart jar to within an inch of the top with the chopped peppers. Pour in white vinegar to cover all peppers. Cover with a plastic lid if possible, as the vinegar will gradually corrode metal lids. Store the jar in the back of your refrigerator for up to 12 months. The peppers will stay crunchy for a few months but will gradually soften. Spoon them out of the jar as you need them. The vinegar is flavorful, too. My favorite pickled peppers are a colorful mix of yellow, orange and red Hungarian hot wax peppers. They're great on sandwiches or mixed into pasta and bean salads. Clean the jars you are going to be using in the dishwasher or boiling water. Bring vinegar to a boil. Wash peppers and either chop then to fit in your jar or put a little slit in them so that the vinegar penetrates them, which is what I did. Add peppers, garlic and peppercorns to a decorative bottle or jar. Pour boiling vinegar over peppers. Make sure peppers are completely covered with vinegar. Leave a little head-space, airspace in between the peppers and vinegar and the lid, and close the lid. Let it sit for a few weeks and enjoy. I always store them in the pantry, if it make you feel better, store in the fridge. *Amount of peppers used depends on how hot you want your sauce and what type peppers you have on hand and how big of a bottle you are going to use. Cayenne peppers are HOT and just after a couple days my sauce was hot and ready to be used. And, of course, I could dry some of them. I did that once when I grew habaneros - just strung them with a needle and thread and hung them in the kitchen. I had a lot of sweet peppers last summer, and I froze a bunch of those. I chopped them into the 1/4" chunks, spread them on cookie sheets and froze them. Once they were frozen, I put them into zipper bags. That works really well and makes it easy to grab just the amount of peppers I need for a recipe - so some hot peppers like that will be nice to have. I didn't put all the raspberries I picked yesterday into the freezer. I decided to use some of them and make this Raspberry Cobbler. I mostly followed the original recipe. Butter or spray an 8 inch square baking pan. Combine flour, baking powder, salt and sugar in medium bowl. Make well in center. Add melted butter, milk and vanilla. Stir until blended. Pour into prepared pan. In another bowl, combine raspberries, sugar and 1 tbsp. flour. Spoon fruit mixture evenly over batter. Bake at 350° for 45 to 55 minutes or until golden brown and done in the middle. Image via WikipediaThe original recipe called for 2/3 cup sugar and 1 T tapioca to be mixed with the raspberries. I cut the sugar in half because I don't like things all that sweet, and I substituted flour for the tapioca because the only tapioca I have is the Pearl kind that's supposed to be soaked - and I didn't want to wait for it since everything else was already mixed up. The flour was fine, but now I'm thinking I need to make some tapioca pudding! After we finish the cobbler, of course, which turned out really good - at least I thought so! Also - Cobbler. 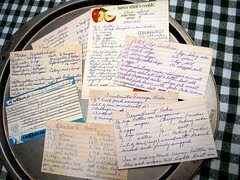 When I was looking up recipes I found some like this with the batter on the bottom and fruit on top and others with the fruit on the bottom and a biscuit-type crust on top. So, which is it? What is a cobbler really?